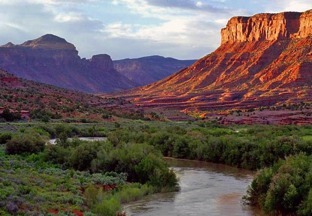 The Dolores River is a tributary of the Colorado River and flows through both Colorado and Utah. 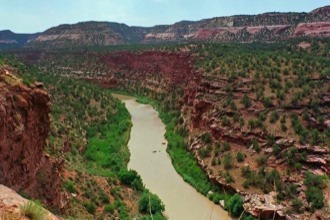 The Dolores River offers different sections of rafting; some with mostly flat water, and others with up to Class IV whitewater. Water flows can vary widely depending on snowpack and demands from irrigation; usually the river is runnable for rafts only from mid-April through mid-June. As the water level drops, canoes or kayaks are most appropriate. Multi-day enthusiasts can plan trips varying in length from 3 to 14 days. Enjoy wildlife, Native American ruins, petroglyphs and beautiful canyon scenery on this wilderness river. The Dolores is a classic Western River trip up there with the Grand Canyon and the Middle Fork of the Salmon.